✔ BASKETS THAT SIMPLIFIES YOUR LIFE - Daily shopping at the super-market can be a chore. This practical bag has a big carrying capacity (45x28x22cm great X-XL) , and when collapsed (45x28x5 cm small ) and withstand a lot of weight (16 kg). 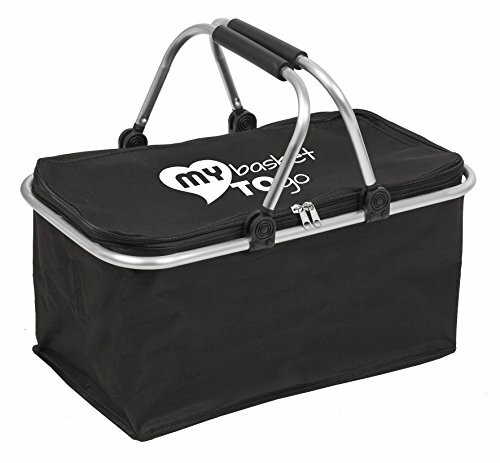 The folding carry-box thus saving you a lot of space when not in use or before shopping. The ideal tool during party, concert, camping, pic-nic, on the beach or sport events. ✔ NO MORE PAINFUL HANDLE THAT CUT INTO YOUR HAND - The comfortable, padded carrying handle is made of rugged aluminum make it possible for even weaker persons to carry a load. The flexible handle can be folded out of the way to ease placing items into the shopper. ✔ HIGH-QUALITY MATERIALS FOR GREATER DURABILITY - The foldable trolley is made of tear-resistant, water-repellent, easily-cleaned polyester fabric. It has a low empty weight, and the rectangular bottom means that items (bottles, containers, cans, pans, etc.) placed into it won\'t tip over easily. Because of its neutral logo, this reusable humper truly is MY shopping basket. This basket is ideal for both, women and men. ✔ PROTECTS YOUR VALUABLES - The basket is perfect for storage in your basement or pantry and be used for a wide variety of products. The lid features a zipper to protect your goods against dust, contamination, and theft. It\'s especially well-suited for shopping, picnics, or camping - or for any activity in which various items must be safely and easily transported. Una bolsa perfecta para tenerlo todo ordenado.